Pictured are demonstrators and a statue of their 'great leader' Donald Trump in Rittenhouse Square on Tuesday, June 27, 2017. 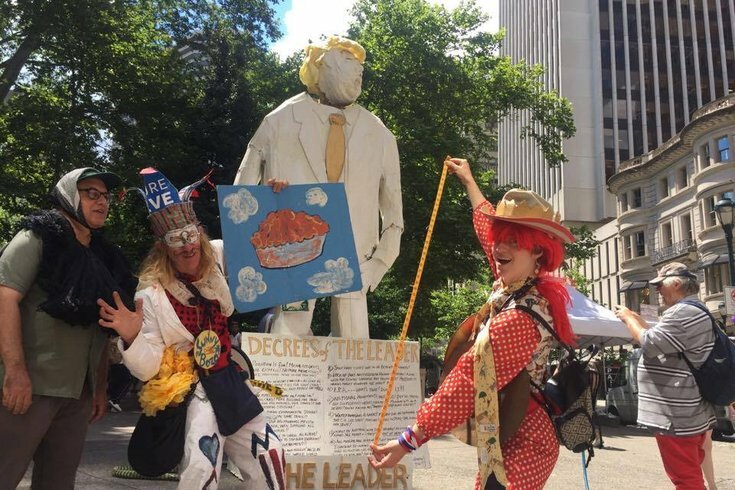 A group of people dressed as court jesters said they wanted to "honor" their "great leader" with a satirical statue of President Donald Trump erected in Rittenhouse Square on Tuesday afternoon. "The statue is the first permanent erection of a statue to the great leader in the entire country of the United States," he said. "And Philadelphia is deeply honored and privileged to receive the statue." Terranore, apparently steadfast on not breaking character, insisted that the statue wasn't satirical, despite the obvious signs to the contrary. "You can come any time and worship, get down on your knees and pray, ask for anything you want – you want more money, you want more jobs — it is yours," he said. • "No more boring environmental studies! ... They all say the same thing!!" • "Sanctuary cities are to be detention camps!" • "All Muslims are terrorists! Get 'em out of here!" • "I consent to groping all women!" 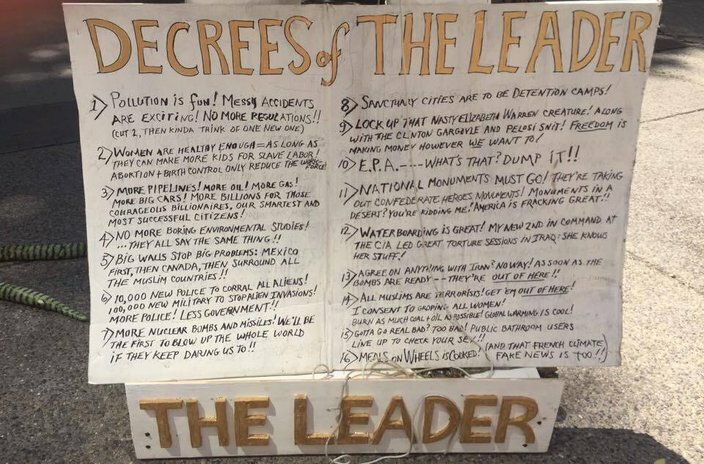 Pictured is the sign under a statue of 'great leader' Donald Trump erected in Rittenhouse Square on Tuesday, June 27, 2017. Two police officers observing the situation said the demonstration was allowed and didn't need a permit. One officer joked they were just "clowning around." Another jester — "Foxy Moxy" — said with comedic but earnest flair she saw it "less as a statue and more as a real, real, real, real, real, real deep feeling." Moxy then proceeded to show how she worshiped the statue, creating a seat for herself with a stuffed snake toy and raising her hands before it and banging a set of cymbals together. She then brought her hands to her knees as if to meditate, while also raising two middle fingers. The statue drew a handful of amused onlookers who took photos and chatted with the demonstrators. One observer sitting on a nearby park wall said the whole affair had been going on for at least an hour as of 3 p.m. It's unclear how long the jesters, who never specifically called Trump by name, would actually keep the statue up, but Terranore insisted it was to be "permanent."